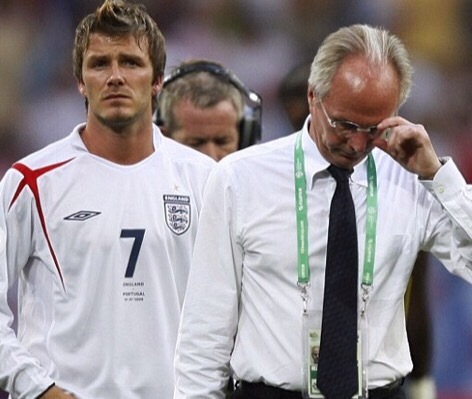 There have been plenty of occasions when England have been built up going into a major tournament, but the 2006 World Cup in Germany was the daddy of them all. England had won the Rugby World Cup in 2003 and finally regained The Ashes in cricket in 2005. Now there was expectation that the football team could end their 40 years of hurt. The ‘Golden Generation’ tag wouldn’t go away, with England billed as possessing one of the best sets of players around and a 3-2 friendly win over Argentina the previous November had heightened expectations. “We had a complete team,” wrote manager Sven-Göran Eriksson in his autobiography. The fact it was the 40th anniversary of 1966 added to the hype, with Sir Geoff Hurst canvassed for his opinion. “I think we’ll be very disappointed if we don’t get at least to the semis,” he told the BBC before England’s opening match against Paraguay. The fact England were in a group with Sweden, Paraguay and Trinidad and Tobago increased the optimism, coupled with the fact they would probably have a very winnable second round tie provided they topped their group. England’s ‘Golden Generation’ were much-hyped going into the 2006 World Cup. The reality of what England could achieve was more dubious. England had suffered a 4-1 friendly loss to Denmark the previous year and then been beaten by Northern Ireland in World Cup qualifying, showing they were far from invincible. Questions were being raised about how well Steven Gerrard and Frank Lampard could link up together in midfield. Eriksson was no longer seen as the messiah who had steered England to momentous wins over Germany and Argentina a few years earlier, with his revelations to the ‘Fake Sheikh’ having marked the final straw for the FA. He would be departing after the finals. There was also great media hype over Wayne Rooney’s fractured metatarsal, as the participation of England’s main attacking threat in the finals was in doubt. Although he recovered to feature in four matches, he failed to score or reach the same level of performance as at Euro 2004 and his tournament would end in controversial circumstances. One area where the English nation could feel proud at the World Cup concerned the number of fans making the journey to Germany. More than 100,000 were reported to have travelled to support the team, many knowing they would have no chance of getting a ticket but wanting to part of the World Cup party. This would be one long beerfest for many. 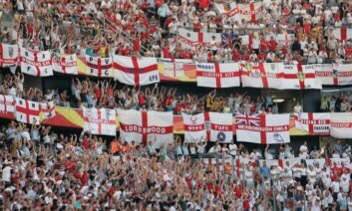 England fans travelled en masse to Germany. Back home the interest in the tournament was also very high, borne out by big screens being installed in city centres so matches could be shown. Unfortunately, some screenings were blighted by violence. Meanwhile, countless individuals sang an England World Cup song as the hype grew. Stan Boardman was one of the dozens to do so; Tony Christie was another. The honour of recording the official England song went to Embrace. The vast majority have long since been forgotten, in keeping with how England were generally uninspiring on the field. There have been plenty of controversial selection choices made when England World Cup squads have been announced over the years – dropping Paul Gascoigne in 1998 perhaps the prime example – and Eriksson’s decision to pick 17-year-old Theo Walcott in 2006 is one of them. The forward had not played a match for Arsenal since moving from Southampton in January and had never been capped by England when the squad was announced. But Eriksson made the shock decision to call him up for the World Cup. “It’s a big gamble. I know it is,” admitted Eriksson, who seemed genuinely excited by Walcott’s pace. Theo Walcott would spend the World Cup watching on from the bench. Walcott was destined to establish himself more with England in the future but the 2006 selection baffled many, mainly because he was one of just four strikers selected – with fitness concerns surrounding Rooney and Michael Owen. Leaving proven strikers such as Jermain Defoe at home did indeed look a gamble and it didn’t pay off. Owen was carried off just moments into the third match against Sweden. Even though England were already through, Eriksson refused to bring Walcott on in his place and he would never enjoy any action at the finals, leading to increased criticism of the player’s call-up in the first place. Gerrard was among the most vocal. Despite having initially backed the decision, Gerrard laid into Walcott’s selection in his autobiography published shortly after the finals. “He had no right to be in Germany. None at all. I was gobsmacked to find him on the plane,” he ranted. And having been left out of the squad for the 2010 World Cup and then injured for the 2014 tournament, Walcott has still yet to make an appearance at a World Cup. Perhaps what defined England’s 2006 World Cup more than anything was the attention given to the squad’s wives and girlfriends – forever to be known as the WAGs. When England triumphed in 1966, the wives and girlfriends weren’t even allowed to sit in the same room as their partners during the celebration banquet. Now, under the liberally-minded Eriksson, the WAGs stayed near their partners during the tournament in Baden-Baden and the socialising and shopping activities of Victoria Beckham and friends attracted widespread media coverage. Critics felt the WAGs were a distraction for the players, with disciplinarian Fabio Capello making sure there was no repeat when in charge of England at the 2010 World Cup in South Africa. Much media attention was afforded to the England WAGs at the 2006 World Cup. Three minutes into England’s opening match of the 2006 World Cup, Paraguay’s Carlos Gamarra turned David Beckham’s free-kick into his own net. England have a tendency to score early in their first game at a major tournament, but don’t always build on the lead. That was the case here as they toiled rather than excelled in the Frankfurt heat, struggling to a 1-0 win. Steven Gerrard’s goal for England against Trinidad and Tobago sealed an unconvincing 2-0 win. The performance in the second match against Trinidad and Tobago in Nuremberg was even less convincing. John Terry had to hook an effort off the line and just seven minutes remained when Peter Crouch appeared to pull Brent Sancho’s dreadlocks as he climbed above him to head home. Gerrard’s excellent strike sealed a 2-0 win and for the first time since 1982 England were through before their final group game at a major tournament. But, given the expectation levels, few were rejoicing. At least though they were still winning even when not playing well. England’s stuttering showings continued in their third match, as defensive lapses meant they were held to a 2-2 draw by Sweden. But the night did produce England’s one real highlight of their five games at the World Cup. With the game in Cologne goalless during the first half, midfielder Joe Cole chested the ball before unleashing a stunning volley from 35 yards that flew into the net. It would be celebrated as one of England’s greatest World Cup goals. Despite winning a host of major honours while with Chelsea, some feel Cole never quite fulfilled the potential shown when he first burst onto the scene as a teenager at West Ham United. But the goal for England against Sweden was one that any player would be proud to score. The result ensured England finished top of their group and avoided the hosts in the second round. England took on Ecuador in the last 16 in sunny Stuttgart. Again Eriksson’s side seldom sparkled against moderate opposition and it took a free kick from David Beckham to earn a 1-0 win and a place in the quarter-finals. But they had still yet to give a display that made them look like potential champions and they could have easily fallen behind before Beckham’s goal – the captain defying illness to play and take England through. David Beckham scored the winner as England beat Ecuador. Going into Euro 2016 this summer, England’s men have not recorded a single knockout victory since the Ecuador win. It is a poor record which sums up their limited achievements in the past decade. England were now ready for their last eight showdown with Luiz Felipe Scolari’s Portugal – just weeks after he had looked set to named as Eriksson’s successor only to turn it down. Scolari had managed Brazil to victory over England at the 2002 World Cup and Portugal to success against them at Euro 2004. But now Eriksson had his chance for revenge, with Portugal being without midfielders Costinha and Deco who were both suspended after a card-laden second round tie against the Netherlands. 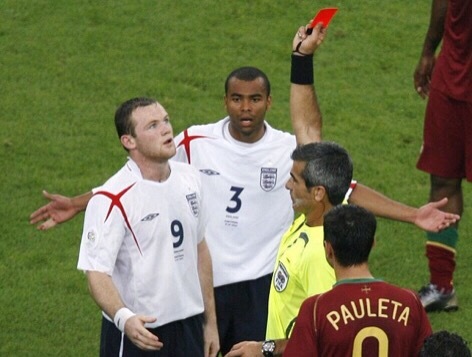 Wayne Rooney is red carded against Portugal. A dull first half in Gelsenkirchen was followed by Beckham limping out of the action early in the second, in what would be his last match before relinquishing the captaincy. Shortly after the hour mark came the match’s key moment, Rooney being adjudged to have stamped on Ricardo Carvalho. 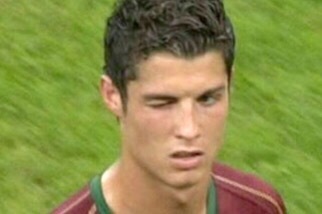 Rooney’s Manchester United team-mate Cristiano Ronaldo appeared to encourage the referee to brandish the red card, before being caught on camera winking at the Portuguese bench. Rooney was adamant when interviewed afterwards that he shouldn’t have been dismissed, as English venom was directed towards Ronaldo. ‘Get lost Ronaldo’ screamed The Daily Mail, claiming few would mourn his probable departure from English football. BBC pundit Alan Shearer said he would not be surprised to see Rooney “stick one on him” when he next encountered Ronaldo. Ronaldo did not leave Old Trafford or England that summer. He remained and enjoyed his best season since arriving in 2003, playing a major part as both he and Rooney won the Premier League for the first time in 2006-07. England’s 10 men battled well and took the tie to penalties, two years after losing to the same opponents that way at Euro 2004. The past record from the spot did not generate confidence but England had players in their squad such as Gerrard and Lampard who were used to taking penalties at club level. But neither converted in the shoot-out, while Jamie Carragher did but was ordered to retake it after taking it too early. He duly missed the second effort. Only Owen Hargreaves – one of the few England players to excel at this World Cup – scored from England’s four penalties. The Portuguese failed to convert their second and third penalties but – thanks to goalkeeper Ricardo – still had the luxury of wrapping it up before England’s final kick, Ronaldo inevitably having the final word. 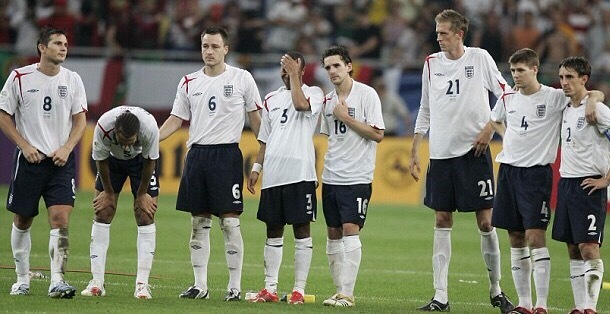 England players yet again experience defeat on penalties. England’s performances had not warranted trophy glory, but that did not soften the blow. The sinking realisation for many was they may not see England win the World Cup again for a very long time – possibly never in their lifetime – and that such a glorious chance to at least make the semi-finals had been spurned. England’s exit meant Eriksson departed after a third successive quarter-final loss to the same opposing manager. His reign tends to divide opinion between those who believe he failed miserably given his high salary and set of players at his disposal and those who defend him, believing a record of three successive quarter-final spots was an acceptable return on balance – particularly given England’s subsequent failings. Eriksson leaves as England boss, while Beckham stands down as captain.